Bubble Trouble, Robert J. Shiller, Sept.25, Project Syndicate: … [A]n outside observer might [be] struck by the weight given to the possibility that the decade-long boom might well suffer a real reversal, followed by serious declines. There seems to be a general recognition of substantial downside risk, as the current credit crisis seems to be related to the decline in US home prices that we have already seen. The boom, and the widespread conviction that home prices could only go higher, led to a weakening of lending standards. Mortgage lenders seem to have believed that home buyers would not default, because rising prices would make keeping up with their payments very attractive. Moreover, the boom resulted in a number of financial innovations, which may have been good ideas intrinsically, but which were sometimes applied too aggressively, given the risk of falling prices. Mortgage-backed securities were urged onto investors for whom they were too risky. As with homebuyers, all would be well, the reasoning went, on the premise that home prices continue to rise at a healthy pace. At the [US Feds] Jackson Hole conference, Paul McCulley of PIMCO, the worlds largest bond fund, argued that in the past month or two we have been witnessing a run on what he calls the “shadow banking system,” which consists of all the levered investment conduits, vehicles and structures that have sprung up along with the housing boom. The shadow banking system, which is beyond the reach of bank regulators and deposit insurance, fed the boom in home prices by helping provide more credit to buyers. Bank runs occur when people, worried that their deposits will not be honored, hastily withdraw their money, thereby creating the very bankruptcy that they feared. It is no coincidence that this new kind of bank run originated in the US, which is the clearest example of falling home prices in the world today. When home prices stop rising, recent homebuyers may lose the enthusiasm to continue paying their mortgages — and investors lose faith in mortgage-backed securities. The US Federal Reserve is sometimes blamed for the current mortgage crisis, because excessively loose monetary policy allegedly fueled the price boom that preceded it. Indeed, the real (inflation-corrected) federal funds rate was negative for 31 months, from October 2002 to April 2005. The only precedent for this since 1950 was the 37-month period from September 1974 to September 1977, which launched the worst inflation the US has seen in the last century. What then helped produce a boom in consumer prices now contributed to a boom in home prices. But loose monetary policy is not the whole story. The unusually low real funds rate came after the US housing boom was already well underway. According to the Standard & Poor’s/Case-Shiller US National Home Price Index, home prices were already rising at almost 10% a year in 2000 — a time when the Fed was raising the federal funds rate, which peaked at 6.5%. The rapid increase thus appears to be mostly the result of speculative momentum that occurred before the interest-rate cuts. Alan Greenspan, the former Fed chairman, recently said that he now believes that speculative bubbles are important driving forces in our economy, but that, at the same time, the worlds monetary authorities cannot control bubbles. He is mostly right: the best thing that monetary authorities could have done, given their other priorities and concerns, is to lean against the real estate bubble, not stop it from inflating. Despite drought and extra hot temperatures in Utah this summer, I am still trying to keep somewhat current. Today I'd like to point to two benchmark 'calls' that may prove very important going forward. The first is by Jim Hamilton, at Econbrowser who recently concluded that "… the truth is pretty simple-- the Fed now does have a very good understanding of inflation, and is not going to tolerate a resurgence." The second is by Yves Smith at naked capitalism who tells us that "The bear credit market has begun." Readers of this blog know that I have been concerned about the state of the credit markets for some time. We've had (until the last month or so), rampant liquidity feeding asset bubbles in virtually every asset class except the dollar and the yen, tight risk spreads (that means inadequate compensation for risk assumption), lax lending standards (that helped create the aforementioned bubbles), and increasing inflation pressures. Now what inevitably happens when credit gets too cheap is that borrowers go and buy stupid things, like housing they can't afford or illiquid faith-based paper or overpriced companies, and at some point enough of this speculation, um, investment, turns out badly that lenders get nervous and start turning off the liquidity spigot. And the wilder the party has gotten, the worse the hangover. Now heretofore, I have merely fulminated about this situation, because at some point, the correction will begin. But it's very easy for people like me to expect things to get rational way before they do (look how long the 1980s LBO wave, the Japan bubble, and the dot com mania lasted). So as much as I have felt for a long time that these conditions were not sustainable, and were likely to end badly, I have refrained from making a call. Smarter people than me, like Martin Wolf of the Financial Times, have similarly pointed out that the global equity markets are considerably overvalued and are certain to mean-revert, but he pointedly refused to say the markets were near a peak. But the few times I've made a specific investment call (and it's been very few times, believe me), I've been proven correct. So as a mater of public service (and doubtless ego as well), I'm making one now. The bear credit market has begun. … [T]he real news [is] the fact that the rating agencies have finally gotten religion and are going to start going through [financial] instruments with a much more jaundiced view. Mind you, they've started with subprimes, but they will get around to CDOs, so this is the beginning of a long and painful process. And even if they are cautious and late to the game, this process is going to force more trading, and the price discovery is going to be very painful. We will follow both, to see if they prove right. Earlier, 5/26/2005 we noted 'calls' that a "top" was close at hand for the housing market. Did we get that one right? I would be remiss not to note that here in Utah the housing market is still booming, or, arguably, is just now beginning to stall, but that is certainly not the case in much of California, in Chicago, New York, Washington DC, Florida, etc. where the "stall" ("fall"?) is well underway. Will we be on target here? 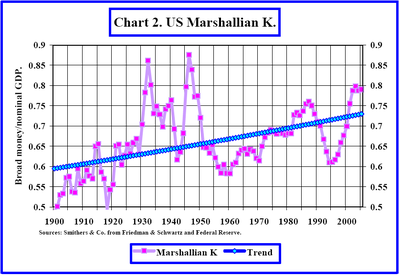 In his latest post, Michael Shedlock (Mish) asks Paul Kasriel some pointed questions about: 1) Impossiblity or near impossibility for the US to suffer Japanese style deflation? and 2) What, if anything, slashing interest rates to 1% (or below) will accomplish if the US falls into that liquidity trap? The short answers are, in my words: "Of course it's possible, even likely, albeit hyperinflation is also a possibility in the runup to deflation." And, "If it happens, helicopter money will not serve as antidote." Most people are not aware of actions the Fed took during the great depression. Bernanke claims that the Fed did not act strong enough during the great depression. This is simply not true. The Fed slashed interest rates and injected huge sums of base money but it did no good. More recently, Japan did the same thing. It also did no good. If default rates get high enough, banks will simply be unwilling to lend which will severely limit money and credit creation. Now, postulating that hyperinflation and deflation occur in sequence, Mish's 12/09/06 post sheds more light via John Succo, in a comment to one of Succo's readers. John Succo's 12/05/06 comment to a reader's question: Can we have a weak dollar AND deflation? Succo: I have an inflation/deflation scenario. I am wrestling with "can central banks induce a round of hyper-inflation or has it already passed?" My conclusion, however, is the same: every hyper-inflationary period (rising nominal asset prices) eventually is followed by a deflationary bust (the last bottle of booze). We are all trying to figure out where we are. But make no mistake: the weight of all that debt created by central banks will at some point be too much to bear. All this credit has created a series of "bubbles" in asset prices. The Fed is disingenuous when they say they don’t try to prevent them, but manage the aftermath. They actually consciously create them as a means to continue speculation and debt growth. The last was supposedly the real estate bubble because it is the largest asset market. But it turns out that the last one might not need one large asset class to "get liquidity into consumers' pockets." It may not even be based on generating consumption. Perhaps the last bubble involves all asset classes and is being accomplished through monetization. The Fed creates credit and then borrowers take that credit and buy Asian goods. They need an asset class, like real estate, as collateral for that borrowing. Then they spend any excess liquidity driven by higher asset prices and spend it. Those created dollars are being sterilized by foreign central banks accomplished by their creating more credit and then buying U.S. securities. Perhaps we are now seeing that last bubble: foreign central banks buying all kinds of private assets like corporate bonds, mortgages, and yes even stocks with that credit. So the last bubble morphs from a consumption bubble to a speculation bubble. This does not seem to bother some as it does me. What happens when governments buy private assets and crowds out private investment? You get excessive risk taking of course; everyone goes into debt even more. I paraphrase Mr. Steve Galbraith when he said "investors have reacted rationally to free money (negative real interest rates). They borrow it. Debt is good when rates are negative." I still wrestle with this comment. It sounds right, but in the end I do not think it is. It sounds right when you look only at return. Of course it is rational to take money at a negative interest rate and lend it back out at a positive one. I have described the yen carry trade as this, but there are ever increasing risks associated with it. In order to get that free money there is currency risk: long dollars and short yen. There is no free lunch. So when investors take that "free money" they risk default when rates return to normal. So when risk is factored in, the risk of losing all, taking free money may not be so rational. And so when governments buy risky assets they in a way force private investors to take risks that are not rational. LBOs are done that make little economic sense and redistribute wealth by destroying it in the future. Hedge funds are given so much liquidity they speculate. The bottom line is as credit expands, nominal asset prices rise. But as credit expands because it is created and not generated by normal economic activity, the debt reaches a point where it can no longer be supported. Central banks are just finding more creative and dangerous ways to cajole markets into taking more credit. I do not know when this point will be reached (deflation). There are signs now of excessive speculation, but I saw that a while ago too. But it is cumulative so we know from deduction that we are getting closer and closer. When deflation does kick in the dollar will rally, yes. But that may be from much lower levels. The only thing we can be sure of is the degree to which this situation has risen. The imbalances are immense. Barry Ritholtz believes that any errors likely from Bernanke are on the side of over-tightening. He also believes that Greenspan's tool of choice was to inject liquidity in the wake of any crisis. The Greenspan game is over, however. Liquidity injections now seem to float all assets and that ain't good by anybody's metric. Bernanke's not going to ruin his reputation by allowing hyperinflation. Here's a snip of Ritzholtz's story. Go there for more. 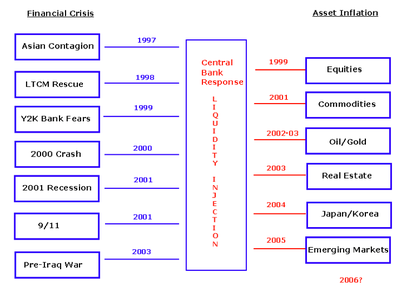 if you want to understand the true problem facing Bernanke, its the liquidity problem. Greenspan treated every issue as if the only possible repsonse was to increase liquidity. Thats like a dentist giving a kid candy every time they complained of a toothe ache. Makes the picture a whole lot clearer . . .
Mark Thoma notes that both Paul Krugman and Robert Reich don't fear inflation nearly so much as they fear "the fear of inflation" and what the Fed may do in reaction to that fear. ...In the end, the people who get clobbered when the Fed raises rates and the economy slows are those at the end of the job line—people who need jobs, or are in low-paying ones. They're the first to be let go. At a time when the number of working poor in America are already ballooning, and the ranks of the impoverished are growing, it's not only economically wrong for the Fed to go on raising rates. It's ethically wrong. OK.. So what is to be done? Clearly the Fed ought not to be focused solely on inflation, but some argue that Bernanke is not single-mindedly so focused, instead trapped in a double-bind: if Bernanke doesn't raise interest rates to stem the tide of speculative frenzy in asset-bubble markets the bubbles continue to inflate. If he does raise the rates the asset-bubble markets will collapse, since they are, arguably, too high already. So what good choices are available to Bernanke? On the other hand, what choices does the US government, and the Administration in particular have? Government actors have already run us deep into trouble re: entitlement promises that aren't likely to be kept—and aren't being kept already (libertarian view of the problem here). Government actors on both major American political parties have been running around pretending to be the terrorist-threat "protector of last resort" on the world stage. Alternative, dimmer views cast this up as warmongering—warring without Populist justification—lining the pockets of the US Military-Industrial complex and others who profit from what some call the "closed fist" that accompanies the "invisible hand" of market capitalism played out on a geopolitical power stage. These alternative dimmer views argue that warmongering serves as a breeder-reactor for more terrorism. Either way, Wall Street doesn't like this seemingly endless warring. So with arguably over-extended entitlement promises (relative to ability and will to "tax"), over-extended reach of the US in geopolitical arenas, personal and public debt approaching high-stress points, what comes next other than the usual gloom and doom that so frequently shows up here and on the bulk of the blogs I read? [Roach]: ... the Fed is sending an unmistakably clear message of a move to policy restraint. And by delivering that message in the context of down markets, the rhetoric of monetary discipline has an even stronger ring. If there’s ever been a time for America’s central bank to take on the markets, this must surely be it. Former Fed Chairman William McChesney Martin put it best in his legendary quip: "The job of the Federal Reserve is to take away the punchbowl just when the party is getting good." For years, the Fed has provided more than its share of refreshments at the biggest party of them all. Those days could now be drawing to an end. This sudden outbreak of monetary discipline around the world very much fits the script of my newfound optimism on global rebalancing. The world’s biggest imbalance -- America’s current account deficit -- is a direct outgrowth of a property-bubble-induced shortfall of income-based saving. Lacking in domestic saving, the US must import surplus saving from abroad in order to grow -- and run massive current account and trade deficits in order to attract foreign capital. To the extent central banks have promoted asset-bubble-related global imbalances by overly accommodative monetary policies, an emerging bias toward monetary discipline is a very encouraging development on the road to global rebalancing. While it’s "tough love" for bruised investors, this may well end up being the requisite correction that clears the decks for the next upleg in the markets. Thank you, again, Ben Bernanke. Because of past Fed policies (decisions he himself participated in), [Bernanke's] choice is now between a severe recession now and a depression later. To the extent that banks have offloaded much of their exposure to Fannie Mae, various pension plans, foreign bagholders via agency debt, and the public at large, Bernanke is likely making a rational choice (if he has the guts to see it through). Is that really worthy of praise? By taking the hit now, Bernanke also preserves the balance sheets of many major US corporations. Face it folks, the carry trade is unwinding. How far and how fast it goes depends on the resolve of Bernanke. Yet unlike Roach, I fail to see how the Fed is doing anything other than self preservation. Of course we are a long ways away from seeing whether or not Bernanke is going to follow through with his threats. To the extent that corporate balance sheets are in far better shape than they were in 2001, he has that ability. For now, the gold market and various carry trade plays seems to believe him. That carry trade unwind has much further to go. In essence gold has been rallying this year for the "wrong reason". Let all of the inflationists be shaken out of their gold on this pullback. My thesis is that gold will eventually start acting like money (an asset to be hoarded in the upcoming deflationary times). … If Bernanke follows through with his threats, gold will likely get cheaper yet. … Gold will act as money to be hoarded and the implosion of the housing bubble will force his hand to reverse course, furthering the advance of gold for the right reason: fighting deflation. Those that missed the latest runup have only one thing to say "Thank you, again, Ben Bernanke"
Brad DeLong : "… Ben Bernanke is smart enough to worry about all future possibilities--and both accelerating inflation and dangerous deflation are possibilities. It shouldn't take long before the markets realize this, even though the press corps doesn't." James Hamilton: "… I recommend the most recent statement of our Federal Reserve Chair as some of the finest economic analysis you will find anywhere. Stephen Roach: "…for the first time in a long time, America seems about to get a meaningful dose of monetary discipline. Ironically, it could be tougher on the markets than on the economy. For investors, that’s a painful wake-up call, to be sure. But in the end, it’s absolutely essential in order to put an unbalanced, asset-dependent US economy on a sounder and more sustainable course. Three cheers for Ben Bernanke! … Of course, he hasn’t really done anything just yet. The Fed could disappoint -- and end up being all bluster and no action. Or there is always a chance it’s too late -- that America’s imbalances are so advanced, the only way out is the dreaded hard landing. But in my new role as the optimistic pessimist, I am willing to give Bernanke & Co. the benefit of the doubt. … My reading of Ben Bernanke’s now-infamous 5 June statement is that he gets it. …"
Nouriel Roubini: "… a very good choice as he is someone smart, pragmatic, with intellectual and academic rigor but also with policy savvy and experience." Brad Setser: "… Bernanke's academic credentials are second to none. … The fact that Bernanke "gets" the current global flow of capital and the fact that he recognizes that adjustment is not painless give me hope. Plus, Bernanke recently has been moving away from the extreme version of the savings glut thesis, even hinting that cuts in the U.S. fiscal deficit would help to reduce the current account deficit. …"
Mark Thoma: "… Bernanke is a much stronger advocate of inflation targeting than Greenspan…." ... By fighting to restore his reputation in the wake of a disastrous speech about the "helicopter drop" theory of fighting deflation, Bernanke is now overdoing it. The long bond and a yield curve that once again has inverted says that Bernanke is wrong. The time for tough talk (and action) on inflation was three years ago. Three years too late Bernanke wants to restore the Feds's credibility. Bernanke (if he is smart) realizes that he has no choice but to continue hiking and sucking liquidity out. - We've had 16 rate hikes over the course of > 2 years. The level of speculation right now is still very high. There is still a lot of liquidity sloshing around. The only way to kill it is to raise rates to near-Volckerian levels (at the risk of a deep recession). - A lot of damage was done in the Greenspan years. Greenspan as a Fed chair was a disaster. But over the course of 20 years, Greenspan has managed to put the US back at significant risk of collapse and managed to squander away all of the beneficial effects of the Volcker-era. Greenspan has had a lot of assistance in this from the Bush administration, of course. The only way to counter this is to squeeze liquidity out completely, kill off speculation and curb the insane American habit of borrow and spend. Yes, this will lead to a recession, possibly a deep one, but the alternatives (high inflation or hyperinflation) is much worse. The worst scenario is a disorderly dollar collapse. - Yes. Housing is breaking. But I think housing would have broken regardless of Fed action, as we were in massive bubble territory there. - If Bernanke does not continue hiking in the face of inflationary pressures, the bond market will collapse. Faith in the fed will be competely lost, potentially placing the banking system at grave risk. Bernanke's communication skills leave a lot to be desired. It would be much better for him to keep absolutely quiet and just show that he will be tough on inflation by action. I feel that rates are going to [go] much higher than most people expect. There just doesn't seem to be any other choice. I am beginning to think that Bernanke will indeed check the overheating. But the proof of "real deal" claims will come if or when markets (housing and stock markets) begin breaking badly. Then we will see whether Bernanke will refrain from "helicopter money" infusions. I still think Bernanke will so refrain, given that hyperinflation isn't a good alternative, even just hyperinflation of precious metals, oil, etc. Then again I thought that Greenspan wouldn't let the Long Term Capital Management bunch off the hook. Yet he did, pretty much. Didn't he? Then went on to blow up all sorts of asset bubbles. What do I know? Faber's "Anatomy of Bear Markets"
Mark Faber recently talked us through the possibilities of long-term bear markets when asset classes are measured in terms of gold. Relative to the price of gold, Both the Dow and home prices have fallen since Oct. 2002. One of Faber's conjectures is that it may be possible to see the Dow Jones at 36,000, 40,000, or 100,000 or more, and "the price of gold could rise from $550 to $3,600, which would bring down the Dow/gold ratio from currently about 19 to 10; or, in an extreme case, gold could rise to $36,000, which would bring down the Dow/gold ratio to only 1 (as was the case in 1932 and in 1980)." This is pretty wild stuff! Could Faber be right? It all depends on what Monetary Authorities do in the face of what some believe to be an impending crisis. And it all depends on what all others do as well. Faber builds his argument from Russell Napier's recently published book Anatomy of the Bear -- Learning from Wall Street's Four Great Bottoms,. I've included a little graphic up front depicting the Dow/Gold Ratio over a long period to illustrate the impact of long term trends. "It's Different This Time!" I Doubt it. One of Paul Kasriel's images caught my attention. The graphic below shows over the last 40+ years the difference between disposable personal income and expenditures on consumer goods and service plus residential investment. As you might guess, we are in way over our heads this time around. How are we going to get out? As the chart below indicates, it is different this time. With rare exceptions like the Great Depression and in the years right after WWII, households have run surpluses. That is, households usually spend less than they earn after taxes. But in recent years, thanks largely to cheap mortgage credit, households have started to run deficits. In dollar terms, households ran a record deficit of $470.6 billion in 2005. Relative to their after tax income, households ran a record deficit of 5.2% in 2005. 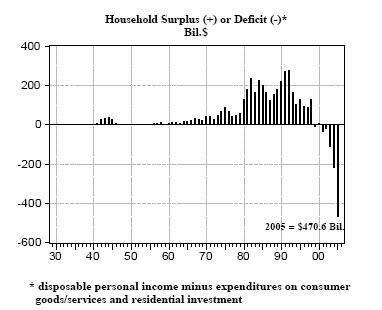 Households in 2005 ran a bigger deficit than did the federal government! Yep, it sure is different this time. I can't wait to see how this imbalance is resolved. Great question. And today Stephen LaChance suggests that the answer is "Yes," in his Would Hayek Hoard Gold? Here are a few highlights for those, like me, who think that we are better served to listen to those who recognize market cycles, risk, reward and moral hazard—and to those like me who are suspicious of chatter about "dark matter" making our so-called economy much better than it looks. …During the tenure of Alan Greenspan, the Federal Reserve fostered a degree of moral hazard that has effectively abrogated the price mechanism in US financial markets. No longer is intervention limited to the manipulation of short-term interest rates through changes to the Federal Funds rate, as had previously been the case, but now includes the influencing of long-term rates directly through bond purchases by other central banks, systemic contorting of the statistics that serve as key market signals, emergency liquidity injections to deal with financial crises, and even direct intervention in the gold market through leasing and covert selling. As a result, what elements of the US credit system that have not already been socialized directly by the government sponsored enterprises, are now dependent on a government safety net of subsidies, guarantees, and what amounts to blanket damage insurance in the form of bailouts. Unsurprisingly, then, a firm conviction has taken root in financial markets that the government and its central bank have both the will and the ability to avert systemic failure. Faith in the omnipotent power of monetary policy is total. Gold is commonly derided as a dead asset, providing neither dividends nor a stream of interest income. Its ability to stand in the face of default, even systemic default, however, makes it immortal as debt-backed financial claims threaten to succumb to the fatal conceit of central bankers. This virtue is enough to turn even the most sober of academics, not least Hayek, to the wisdom of W.C. Fields, who once quipped "I'm more concerned about a return of my capital than a return on my capital." PS.. For a very good relook at Hayek, see Elizabeth Anderson's ongoing commentary at Left2Right. Specifically look here for Anderson's most recent, and here for links to several others. I recently added Left to Right to my progressive news and views on the sidebar. I don't know why I hadn't until today.